Muddy boots and red socks : a reporter's life · One Book. One Author. One Hour. Notes on front endpapers: Peter Osnos/Random House Moscow. Didn't own a TV--never watched. Elmer Lower--all three networks news at the same time. Mother Quaker--C.o. Pacifist Family. Vietnam v. Iraqi War censorship. Member of Council of Foreign Reporters. Honesty, courage. NYT, three wire services (AP, UPI, International News Service), ABC. Every continent except Australia. Never been fired. Profited from others' pain. Ghost--aged Buddhist monk. Saigon, 7 years. Married 1966. AP--wire service depersonalized , factual reporting. Peter Arnett, Horst Faas. 1963 Buddhist story. Buddhist priest burns for Buddhist demands. Chester Bowles agreed to ferry film of an attack on journalists by police to Washington. Kennedy. Halberstam, Arnett, Neil Sheehan, Browne on assassination hit list. Pulitzer 1963 with Halberstam. Journalists blamed for Vietnam War. 4 Chinese shot. Greatest turning point in history. Oscar Wilde a cousin. Swarthmore College. Father worked in NYC. Mother died at 57. Goethe--German. 1945 Music discovery. The Atomic Bomb. Trust in wartime. Quaker mother pacifist. Science--spiritual needs. Oppenheimer. Chemistry. Finger accident. 1956 drafted. Korea. Army PIO--became journalist. 1950s 1. Asia; 2. Journalism. AP in Baltimore--letter to Gallagher. Crimean War. William Howard Russell of the Times of London. Viet Nam will be forgotten. Council for Foreign Relations--press fellow 1966-1967. David Hudson--CIA. An, VC worked for Time. No time for bars. Kennedy flaw=secrecy. Photos at Bien Hoa--seized by American military. Copy sent via PTT. Censorship--unofficial no less pervasive. Correspondents free to travel in Viet Nam; Persian Gulf correspondents' movement rigidly controlled by American forces. Wife Le Lieu. Pham Ngoc Thao--seen as a prophet by Alsop and other American Diem regime boosters. Viet Nam War different from crusade Washington depicted. Aging reporters--loss of humility, intolerance of foolishness. Success depends on listening, suppressing one's thoughts, stimulating newsworthy responses without interjecting one's persona into the conversation. Conservative criticism during the early years focused on David Halberstam, Neil Sheehan, author, Peter Arnett. Argument with John Wayne--Wayne and other actors deluded Americans about the facts of Viet Nam. Wes Gallagher--real hero of Viet Nam. William C. Westmoreland. Alsop. Col. Pham Ngoc Thao revealed after war to be high-level Hanoi agent. Marguerite Higgins. Homer Bigart. America could not win civil war between Vietnamese. News Feeding frenzy. Tet offensive. Charlie Mohr--NYT, 1989 heart attack on 60th birthday. Welles Hangen of NBC. Author shot down three times. Dickie Chapelle--female Ernie Pyle. Bernard Fall killed by mine on Street Without Joy, 1967. 1972 Alex Shimkin, Newsweek, killed. Chief competitor--UPI's Neil Sheehan. Censor in Brazil--called Browne on "tricks." "I had no TV." Grew up without one, did not own one in the 1950s/60s. Felt TV was a toy. Moved over to ABC. Elmer Lower. Agreement of networks to show news at same time, never show a movie while other networks broadcasting news. Stories typed out, memorized, rehearsed, performed. Cameramen real heroes of TV news. Cut-aways, establishers. As TV reporter--felt like circus barker, always felt something wrong. ABC radio broadcasts--contrasted US propaganda to Viet Cong. Conservatives did not like suggestions that leaders botching war. Believed no American POWs remained in Viet Nam after war. Best journalism is fiction. 1966 press fellow--Council on Foreign Relations. Studied Mandarin and courses at Columbia on Arabic and African politics. Attended weekly black-tie dinners for celebrities including dictators/potentates. Got to know Allen Dulles. Viet Nam--few willing to tell whole truth. During lectures, faced Viet Nam crusaders like Herman Kahn calling Browne and his colleagues as inexperienced, taken in by Viet Cong. Antiwar activists thought he was on their side as did Pentagon, who wrote him off. Martin Luther King. Admired senators Ernest Gruening and Mike Mansfield. Buenos Aires--1968. Learned whom to bribe and how much. 1971 Pakistan. Brought dog. Most people in 3rd World unneeded/unwanted by rest of human race, living in lands that cannot sustain them. Bangla Desh--few jobs, poverty beyond belief. Price of human skull in America can feed a Bengali family for a year. 3rd World not developing, putrefying. Kindly instincts may do more harm than good when real ogre is overpopulation. 1990 Lancet--worse things than a merciful death--millions would be better off dead. 1976 Belgrade. 1993 returned--Lithuania, Czechoslovakia, Bulgaria. Ethnic strife smolders in Romania, Hungary--former Soviet states. Tito. Ambassador Larry Silberman. Prague--most beautiful city in the world. Jim Markham strong words. Killed himself in 1989. Trip to Nha Trang. Trauma at the end--fall of Viet Nam--never returned. 1977 returned to US. Grenada. Persian Gulf. Senate testimony--news coverage constrained/controlled by Pentagon. Honest reporting--many do not want it during war. Antarctica. 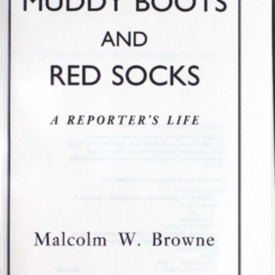 Browne, Malcolm W, “Muddy boots and red socks : a reporter's life,” One Book. One Author. One Hour., accessed April 21, 2019, http://booknotes.gmu.edu/items/show/267. Program air date: September 26, 1993. A war correspondent recounts his thirty years of experience in the field covering stories all over the globe, from Cuba and Argentina to Vietnam and Saudi Arabia.